You've probably heard this expression before: The key to good writing is re-writing. That's not to say a writer couldn't get it right on the first draft. Some writers can sit down and produce a publishable story in one draft--or one draft and minor cleanup. I admire them! But many of us--perhaps MOST of us--aren't like that. Stephen King for instance. How Many Re-Writes Are Enough? Now let’s talk about revising the work—how much and how many drafts? For me the answer has always been two drafts and a polish (with the advent of word-processing technology, my polishes have become closer to a third draft). Whatever works for you--whether it's 1 draft or 21, that's okay. The important thing is that we finish. As Neil Gaiman says, "You write./ You finish what you write (Advice to Authors). An integral part of re-writing is editing. For advice on editing I've turned to Ray Morton and his wonderful article, Rewriting is Writing. The single most important tool you will need to do a successful rewrite is perspective—the ability to see your work for what it is, rather than what you hoped it would be. Perspective is impossible to attain when you are caught up in the frenzy of the creative process. So, once you have finished your initial pass, walk away from it for a week or two, or five. This break will ensure that when you return to your work, you will be able to view it with fresh, objective eyes. Now let’s say you’ve finished your first draft. Congratulations! Good job! Have a glass of champagne, send out for pizza, do whatever it is you do when you’ve got something to celebrate. How long you let your book rest—sort of like bread dough between kneadings—is entirely up to you, but I think it should be a minimum of six weeks. During this time your manuscript will be safely shut away in a desk drawer, aging and (one hopes) mellowing. Your thoughts will turn to it frequently, and you’ll likely be tempted a dozen times or more to take it out, if only to re-read some passage that seems particularly fine in your memory, something you’d like to go back to so you can re-experience what a really excellent writer you are. I would add: DO NOT EDIT! Read it through once and take notes on what needs to be added, deleted and changed in a separate file or on a pad of paper. And NO going back or skipping forward. Read it through from first to last. This can be painful. You'll see constructions that are, to say the least, infelicitous. Resist the urge to change them. Why? Because if you're anything like me once you start editing you just won't be able to stop and what you really need to do is re-load the entire story back into your head. If you begin changing your manuscript before you've fully reacquainted yourself with the story you could make disastrous mistakes. For instance, once I forgot where I was going with a particular arc and wrote (what I thought was) a beautiful scene which took one of my main characters in a completely different direction. As a result I either had to change a major aspect of the plot or throw out one of the strongest scenes. I elected to put the book aside while I pondered the delemma. I still haven't picked it back up! "Is the premise of the piece understandable and established early on?" The premise is the seed from which the rest of your narrative grows and must be clearly set up in the opening pages of your ... [novel]. If you have reached page 15 or 20 and it is still not obvious what your story is about, then you have some work to do. "Does the ... [manuscript] tell the story that you intended it to tell?" When deeply immersed in the writing process, it’s easy for a writer to get carried away by subplots, wander off on tangents, and become enamored by a single scene at the expense of the overall narrative. If that happens, use the rewrite to get your tale back on track. "Are there any elements in the ... [story] that do not directly support the central theme or narrative?" Anything that does not serve the story gets cut. As Stephen King says: Kill your darlings! "Is the protagonist’s primary goal clear and does his pursuit of that goal drive the narrative?" In dramatic storytelling, a protagonist has a strong objective that he/she sets out to achieve. All of the choices the protagonist makes, every action he takes and obstacle he overcomes should bring him closer to accomplishing that goal. If they don’t, then you must redirect him. Is every single piece of backstory "vital to the narrative or theme of your piece"? Is it the right genre? Does your story fulfill its genre expectations? In other words, if it’s a comedy, is it funny? If it’s a horror film, is it scary? If not, then a major rewrite is in order. Now that you've reacquainted yourself with the story and you have a list of things that need to be deleted or changed, get to it! Just as you need a break between the first and second draft, so you need to take a break between the subsequent drafts, but perhaps not as long of a break. Take a day or so off then continue the editing process. Depending on your process, you might have let someone, or perhaps even a few people, read your manuscript after the first draft. Regardless, at some point your manuscript will reach a finished stage and then you'll send it out to your beta readers. At this point I would give my manuscript to my critique group and to other writers I've met over the years and ask them for feedback. I would add that you should choose readers who are familiar with the kind of book you've written. For instance, if it's a paranormal romance, don't ask someone who only reads science fiction to critique it. They'll proably hate it, but that's okay, they'd probably hate the best paranormal romance. This also goes for reviews. In general, you don't want a review from someone who dislikes, or who is completely unfamiliar with the genre your book is from. Once all of your analysts have responded, analyze their analysis. If one person takes issue with some aspect of your script, then it could just be that person’s problem. However, if a number of people have the same problem, then it’s likely that the fault lies with the script and will need to be addressed. Feedback doesn't do any good if it's ignored. Do another rewrite. By this time it'll probably be physically painful to go back to your book and make changes, but you're almost done. Ray is giving advice to scriptwriters but I'm passing it on because most of it applies to novelists. Most of it, this is one thing that's different. A screenwriter can throw a party and ask his friends to each take a part and help read the script, but this would be more difficult for a writer to do. For starters, novels are generally much longer than screenplays! Get someone else to proofread your manuscript. If you can afford it hire a copy editor to look for grammatical mistakes, logical errors, typos, misspellings, etc. If you absolutely cannot afford a copy editor then strike a deal with one of your writing friends, get them to line edit your manuscript and in return you can line edit theirs. [T]ake your time and put as much care into the rewriting of your work as you put into the initial writing. It may take more time in the short run, but the long-term rewards will be worth it. I added this point. As soon as you've either sent your manuscript off (whether to your editor or to a self-publishing platform) you owe it to yourself to relax and celebrate your achievement. Well, that's it! If you only remember one thing from this post I hope it's this: Whatever happens, even if you think it's hopeless, finish your story. Later you'll be glad you did. 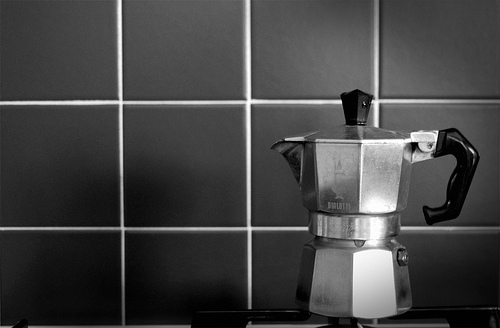 Photo credit: "Bialetti Robot" by _Zeta_ under Creative Commons Attribution 2.0.
good wrap up of the process. ...er...missed mentioning the open artery. Ack! I knew I missed something. ;) Yes, editing is painful. Sometimes I think editing the first draft is harder than writing the first draft. Thanks Ariene! I appreciate your comment. I agree. For me, the hardest part is doing a read through without editing. I think this is really important, but if you interrupt that read through to edit, you don't gain the full benefit of reading the entire piece as is. You may catch some typos, but you lose the chance to spot revisions that may be required. Great post! "I agree. For me, the hardest part is doing a read through without editing." Yes! I'm exactly the same. I've been working on my second draft of my NaNoWriMo story. Reading the first draft through was painful! But a great idea. I'd forgotten some of the plot twists. I think I finished my outline in record time and all because I read the manuscript through, first, without diving in. Anything that does not serve the story gets cut. As Stephen King says: Kill your darlings!" So, those are darlings? parts that are useless for the story? if is so, I'm lucky. I never had problem when I had/have to kill my darlings. Yes, darlings do not move the story forward AND they're usually its of prose the writer is fond of. After all, if we didn't care about then they'd be easy to axe. "if is so, I'm lucky. I never had problem when I had/have to kill my darlings." That makes you unique in my experience. :-) Congrats!